Through a detailed examination of research conducted in Sackville, New Brunswick, this study synthesizes the findings of a series of focus groups and one-on-one interviews with the aim of achieving the following objectives: to identify and elucidate the important challenges related to climate change that New Brunswick coastal communities are currently facing; and to highlight solutions to these challenges. A number of key impediments are identified (e.g., low levels of community consensus) and the following solutions are proposed: to use flood risk visualization and software to aid adaptation planning; to ensure that high quality data are routinely gathered and shared; to build on ongoing community collaboration and communication; and to strengthen political and community leadership. Grâce à un examen détaillé d’une recherche menée à Sackville, au Nouveau-Brunswick, cette étude résume les trouvailles d’une série de groupes de discussion et d’entretiens de face à face en vue de réaliser les objectifs suivants : déterminer et élucider les défis importants en matière de changement climatique auxquels sont actuellement aux prises les populations côtières du Nouveau-Brunswick et mettre en évidence des solutions aux problèmes en question. On a cerné un certain nombre de principaux obstacles (p. ex. peu de consensus au sein des membres de la collectivité), et les solutions suivantes ont été proposées : utiliser la visualisation des zones exposées aux inondations et des logiciels afin de faciliter le programme d’adaptation, veiller à ce que des données de grande qualité soient recueillies régulièrement et partagées, miser sur la collaboration et la communication continues au sein de la collectivité, renforcer le leadership politique et communautaire. 1 Hurricane Sandy, which struck the eastern seaboard of the United States in October 2012, was accompanied by a four-metre storm surge that seriously affected New Jersey and New York City. Economic damages have been estimated between US$30 and US$50 billion (“What Sandy Did Next,” n. pag.). Driven by warming sea surface temperatures (Weaver), storms such as this are part of an associated rise in the frequency of severe hurricanes (Intergovernmental Panel on Climate Change 30). To make matters worse, the paths of typical mid-latitude storms are tracking farther to the north than in the past (Weaver), rendering the risk of Canadian Sandy-like hurricane events more likely than ever before. Due to rising sea levels caused by thermal expansion, melting glaciers, and post-glacial “sinking” of the earth’s crust, also known as “crustal subsidence” (Daigle 2011 7–8; Webster et al. 12–13), Atlantic Canada is particularly vulnerable to tidal inundation, accelerated erosion, rising water tables, and ecological changes (Vasseur and Catto 131–33). New Brunswick’s extensive coastal exposure and erodible shoreline mean that sea level rise (SLR) related to climate change poses a significant challenge to its coastal communities. In keeping with general patterns of land settlement (Cohen et al. 1211), a significant proportion of New Brunswick’s population lives in close proximity to the coast, illustrating that the ultimate impact of coastal flooding has as much to do with human behaviour (e.g., where people choose to live) as with how the climate is changing (Wilby and Keenan 2). 2 The ability to respond to these threats requires an understanding of the interaction between environmental conditions and human systems (Turner et al. 8074; Adger 270). Mounting coordinated, community-wide responses to lower risk is a difficult process, which is further complicated by barriers posed by differences in individual awareness, perception, values, etc. (Adger 274). Conceived in an effort to better understand the socially and psychologically constructed barriers to climate change adaptation, this study references published reports and papers while summarizing the findings of four separate sessions of focus groups and one-on-one interviews. 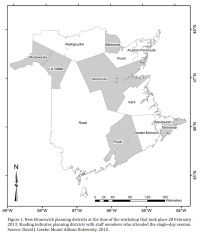 This paper synthesizes these findings and places them within a provincial context to address two main objectives: first, to identify the challenges obstructing community adaptation to climate change within New Brunswick; and, second, to highlight general solutions for lowering community vulnerability and increasing resilience. 3 In the Tantramar region of southeast New Brunswick, flooding is a problem with a long historical record. For example, the area was heavily inundated during the 1869 coastal storm surge christened the “Saxby Gale” (Lockett 15). Like some other Maritime communities, Tantramar depends on its dyke system for flood protection (van Proosdij and Page 24). Unfortunately, Lieske and Bornemann have documented the inadequacy of the extant dyke system to cope with the least severe of Daigle’s sea level projections: a 1-in-10 year extreme storm event (accompanied by sea levels of 8.9 m ± 0.1 m, CGVD28 datum) has the capacity to overtop 90 percent of the current dykes and to flood over 20 percent of the town of Sackville (Daigle 2012: 29; Lieske and Bornemann 14). A team of researchers conducted a GIS-based economic analysis and estimated that under a “do nothing” strategy, the direct economic damages costs are likely to accrue to CAD$59 million over the next century (Wilson et al. 9). Relying purely on engineered solutions is an increasingly untenable strategy, but the community is largely unaware of or unconcerned by this fact (Lieske et al. 84). 4 The consultation projects upon which this paper is based can trace their origin to the community adaptation initiative sponsored by Natural Resources Canada (NRCan) and the provinces of Canada between 2009 and 2013. In the Maritimes, the Atlantic Regional Adaptation Collaborative1 (RAC) was administered by the Atlantic Climate Change Adaptation Solutions Association (ACASA), which oversaw the many research initiatives that occurred during that period. As part of its research investment, ACASA acquired high-resolution lidar digital elevation data for the Tantramar region gathered by a small series of survey flights flown between 2009 and 2011. As a result of this high- resolution (1 m horizontal, ±16 cm vertical) topographic data becoming available for analysis, the Mount Allison University geospatial modelling lab (GML) was able to examine the potential impacts of coastal flooding from sea level rise and to assess the efficacy of using flood risk visualizations as a communication tool. The latter objective culminated in two peer-reviewed publications (Lieske; Lieske et al.). Parallel to this effort, the New Brunswick Environmental Trust Fund (ETF) sponsored four separate consultation projects intended to improve awareness of regional flood risk, and conducted community adaptation research. This new effort built on the findings of the previously published research and was able to capitalize on the newly established community network. The results of these four consultation projects are synthesized in this paper and discussed in the following section. 5 Data upon which this paper’s synthesis is based stems from qualitative information gathered during four separate consultation projects: consultation with expert community stakeholders; consultation with the general public, using science café methodology; consultation with provincial planners interested in the geospatial aspects of climate change; and consultation with the wider community of provincial planners using one-on-one interviews. The first project consisted of three workshops conducted in November 2013. During these meetings, Lieske, Roness, and Phillips engaged expert stakeholders in the Sackville community (which included members of Sackville town council, dyke managers, engineers and emergency responders, planners, community service providers, environmental groups, and other key members of the public or private sectors) in discussions about community adaptation. A total of thirty-seven people participated over the course of the three workshops. 6 The second project consisted of four public presentations conducted using a science café format. A science café is a public presentation given by an expert in a scientific or technical field, followed by an egalitarian discussion between that presenter and lay people on the subject of the session (Bagnoli and Pacini 194). Science cafés are organized in local spaces that are familiar and culturally appropriate for the members of a specific community (e.g., cafés, bars, community centres, etc. ); this approach effectively takes research out of institutions and into community settings that are comfortable for non- scientists (Bagnoli and Pacini 195; Cumberland n. pag.). A common format for science cafés features a short presentation (twenty to thirty minutes), followed by a break (five to ten minutes), and then a longer discussion (sixty to ninety minutes) (Hirakawa 206). Phillips conducted four such science cafés in the Bridge Street Café of Sackville between March and April 2013. 7 The third project was conducted by Lieske and Roness on 28 February 2013 to explore the challenges confronting a small group of New Brunswick land use planners with an interest in the geospatial aspects of climate change. Of thirty-eight invitees, eleven attended the session, representing six of the twelve then-existing planning commissions, and an independent land use planner (Figure 1). It is important to note the commissions represented on the map have since been reorganized into regional service commissions. While focusing on identifying the perceived barriers and anxieties associated with public communication of climate change risks, this study elucidated a wide range of general issues (Appendix 1). Figure 1. New Brunswick planning districts at the time of the workshop that took place 28 February 2013. Shading indicates planning districts with staff members who attended the single-day session. Source: David J. Lieske, Mount Allison University, 2015. 8 The fourth and final project, conducted by Fox, involved semi-structured, open-ended, one-on- one interviews with fifty-nine professional planners in New Brunswick during the period May 2011 to February 2012. The goal of this project was to better understand the efficacy of the provincial planning process, particularly the opportunities and obstacles fostering or inhibiting community sustainability. 9 All of the four consultation projects employed standard qualitative research methodologies. In the first and third projects, focus groups were conducted in such a way that the opinions volunteered by participants were transcribed using both a combination of group note-taking and a survey involving semi-structured, open-ended questions administered at the end of the session to individual participants. Data for the second project (science cafés) was primarily gathered by digital audio recording. One-on- one interviews for the fourth project were targeted depending upon the area of expertise and responsibilities of the participant (Appendix 2). Results from the four projects were subjected to a thematic analysis in an effort to identify areas of interest or concern to participants, which were then supplemented by our own observations. 10 By identifying the key themes that materialized across the various consultations, a cluster of issues emerged as impediments to adaptation. These barriers, which are partly psychosocial, partly information-based, and partly political, have been organized under the following categories: public education and awareness, data availability, community consensus building, community cohesion, and government and community leadership. 11 Education and communication were identified as important components of adaptation planning. For instance, participants in the workshop conducted as part of the third project in February 2013 admitted that they were hesitant to communicate the risks associated with flooding, partly due to their fear of creating anxiety or panic, and partly due to their reluctance to confront constituents who may be unaware of the problem. Across the projects in general, there was a consensus that communication was a necessary prerequisite for building support for land use decisions, that it should be an important part of a long-term outreach strategy, and that it has to be conducted over multiple sessions. Furthermore, it became clear that there is often a degree of disconnect between those engaged in scientific research and education, on one hand, and, on the other, those responsible for decision-making, public policy, and outreach. In other words, it is not just the general public who is unaware of research findings and their implications: elected officials and public policy-makers do not always appear to appreciate or have an accurate understanding of the information presented to them by researchers. This speaks to ongoing challenges in transferring knowledge outside of science and social science arenas, and suggests that communication strategies need to target elected officials and public policy-makers as well. 12 As the various projects of the Atlantic RAC draw to a close, there is now a significant body of research findings from studies in the sciences and social sciences pertaining to the Tantramar region. The many projects funded through the national and Atlantic region programs on climate change adaptation have produced reliable and compelling evidence of such developments, yet the challenge remains: how will we effectively raise awareness and inspire action in our public policy-makers, elected officials, and community members at the local level? Which novel approaches as well as infrastructure planning and adaptation strategies will our local communities adopt and implement as a result of these findings? What level of interprovincial cooperation will take place on these issues and who will lead the process? For the Tantramar region, and potentially farther afield in neighbouring Nova Scotia and beyond, emerging groups addressing these pressing issues consist of a number of partnering agencies and municipalities. 13 The visualization of anticipated impacts (either spatially or non-spatially) has an important role to play in risk communication. It has been demonstrated that when properly designed, visualizations can counteract the cognitive biases of individuals, help focus their attention on important trends, and provide them with the information and inspiration to make proactive adjustments in their own lives in order to lower their personal vulnerability (Lieske 2012). Visualizations can inspire interest, command attention, and possibly attract a wider and more diverse audience (Berry and Higgs 230). Risk communication should be seen as a narrow and temporary window through which risks can be communicated and a long-term intention to adapt inspired. 14 Organizers of outreach efforts related to climate change should encourage a two-way exchange of information. Moreover, they must package their communication with tangible and useful support. They can, for example, place participants in touch with peer-support networks, such as those available on social media, and recommend ways to lobby for the adoption of adaptation strategies. Trust between the communicator and the audience is also an important co-requisite (Lieske et al. 92). In the Tantramar case study, initial fears of creating panic were ultimately proven to be unjustified, as evidenced by the generally calm reception to flood risk information exhibited during the focus group sessions conducted by the researchers. 15 Anecdotally, some local stakeholders shared with us that the information disseminated through this process increased their knowledge and built their confidence to confront the problem publicly, which directly contributed to the publication of a section of the flood risk map in the centre spread of the Sackville Tribune on 13 March 2013. As a result of this careful groundwork, the adoption of the new 8.9-m flood risk map was entirely non-controversial and passed its third reading in town council on 9 September 2013. Based on hearsay, we can indicate that some felt that in fact a more extreme flood risk map would have likely passed. 16 It is important to emphasize that the presentation of evidence must be executed carefully in order to not confuse the public. Climate change information is often jargon-laden, and members of the general public are normally unfamiliar with the traditional representation of information (e.g., trend lines). Animations, such as a bouncing ball following a trend line, can be more visually interesting, aid in focusing the audience’s attention on relevant aspects of the data, and ultimately result in better long-term retention of the information than ordinary graphs (Figure 2). Published research shows, however, that complicated visualizations should be accompanied by background explanatory information (Appleton and Lovett 322–23; Jude; Lieske et al. 92). Without this support, the audience members may misinterpret the underlying assumptions of the visual model or derive incorrect conclusions. 17 Personalizing visualizations so as to maximize familiarity with the imagery in target audiences is vitally important. Furthermore, when risks have a historical precedent, sharing old photographs with the audience can be deeply impactful. In the Tantramar case, significant coastal flooding due to a storm surge has not happened since the nineteenth century. To achieve similar effects as the presentation of old photographs, a three-dimensional animation was developed that enabled the researchers to convey the potential physical impact of such an event. 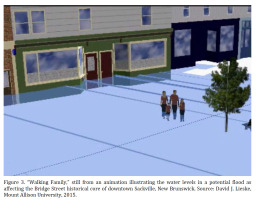 An animation called “The Walking Family” was created to illustrate the challenges that a typical family would face while attempting to navigate through the flooded historic downtown core (Figure 3). Figure 2. Adobe Flash–enabled viewer for displaying an animated time series of tide gauge records for Saint John, New Brunswick. Figure 3. “Walking Family,” still from an animation illustrating the water levels in a potential flood as affecting the Bridge Street historical core of downtown Sackville, New Brunswick. 19 Other aspects of the overall communications strategy have included two very successful Sackville “climate change awareness weeks” in the spring of 2013 and 2014, which offered a series of public outreach displays and events (e.g., a large-size printed map of the town’s coastal flood vulnerability to an 8.9-m sea level rise). This event, complemented by a four-page feature article submitted to the local newspaper, served to draw attention to the topic of climate change and reached a cross-section of the community not normally accessible during traditional public information sessions. 20 As a final note, the involvement of the Department of Geography and Environment at Mount Allison University demonstrated the role that universities can play in facilitating community adaptation. A community-based course called “Local Adaptation to Climate Change” brought students together with research scientists as well as municipal and provincial policy- and decision-makers to investigate the processes involved in the teaching-learning-research framework of education for sustainable development. The course also provided a forum for collaboration and the dissemination of research findings. In fact, student-led activism helped push the new flood risk map through the planning process and contributed to its eventual adoption as part of the Sackville Municipal Plan. 21 The participants in the third consultation project, who were drawn mainly from smaller rural planning districts, reported that it was difficult for them to access high quality data that would help them to build defensible flood maps. For instance, unlike planners in Moncton and Sackville, participants in the third consultation project session were from planning districts that had not yet been surveyed using very high-resolution lidar elevation data. Other information gaps were also identified—for instance, a lack of reliable prediction surfaces of potential river flooding, and the absence of digitized waterways of scales finer than 1:10,000. In addition, participants reported that they were discouraged from gathering their own data. It should also be noted that the focus groups from the first consultation project singled out technology resources and advanced expertise at universities as important resources that needed to be tapped into (Appendix 1). This underscores the fact that the mere provisioning of data is insufficient without the assistance of scientists and analysts capable of leveraging that information to support decision-making. 22 Complete, high-resolution lidar coverage of New Brunswick communities should be a high priority for the province. Moreover, stream gauge data needs to be collected as part of a wider network, and connections between rainfall and river water levels should be analyzed in order to build an empirical model of water levels under future climate change scenarios. Such data gathering cannot be considered a one-off exercise, but should be supported as part of a long-term monitoring program designed to facilitate the understanding and predicting of future flood events and impacts. This data should be gathered as part of a provincially managed effort, with information held centrally but shared with jurisdictions as needed. Encouragingly, the previous New Brunswick government signalled a commitment to support ongoing data collection through research and to play a greater coordinating role, as evidenced by its publication of the New Brunswick Flood Risk Reduction Strategy and the New Brunswick Climate Change Action Plan: 2014–2020. It is hoped that these strategy statements continue to receive support in the future. 23 Participants in the third consultation project were of the opinion that it is difficult to assess objectively the true level of risk posed by climate change and even more difficult to come to a general agreement on adaptation strategies. If this appraisal is generally true, achieving solidarity around any particular adaptation solution will be difficult, and the likelihood of public support for adaptation initiatives will be diminished. Participants also indicated that unless money is at stake (i.e., there is an economic interest involved), attendance at public information sessions tends to be low. Community divisions were most obvious in the context of public sessions when naysayers were in attendance. According to February 2013 workshop participants, naysayers are committed to confusing the issues at stake and actively undermine attempts at consensus building by spreading misinformation or organizing contrary “blocs of resistance” at public meetings. 24 There is a role to be played by public participatory GIS (PPGIS) as a consensus-building tool (Aggett and McColl; Bailey and Grossardt; Barndt; Craig and Elwood; Sieber). The Tantramar Community Adaptation Viewer (TCAV,5 Lieske 2015 107) is an easy-to-use, Web-based software toolkit enabling the exploration of spatial patterns of community risk and vulnerability. This novel technology supports the interactive identification of vulnerable locations, the construction of adaptation zones, the analysis of expected economic damages in Canadian dollars, as well as the assessment of social vulnerability (based on Statistics Canada census data from 2006). A test deployment of this software for the town of Sackville occurred in January and February 2014, with small groups of expert stakeholders brought together for three-hour sessions to explore the community’s flood risk vulnerability. Many issues were raised and risks at specific locations were identified (e.g., particularly vulnerable roads and residences, as well as sewage lift stations). The sessions resulted in a thorough analysis of community vulnerability that included the estimated costs of damages to flooded neighbourhoods and the locations of services utilized by vulnerable members of the community. An important next step is to continue discussing ways in which to mitigate these risks as well as how to involve a broader section of the general public, such as elders and people with restricted mobility. 25 In February 2013, participants expressed concern that when confronted with climate change information, communities may splinter into flood-affected and non-affected groups. Participants suggested that there might be resentment toward people who knowingly build in flooded areas and then subsequently receive government compensation for damage due to flooding. 26 Community cohesion is an important requirement for successful adaptation and resilience (Appendix 1). In November 2013, participants identified the need to encourage community ownership of the problem or issue at stake, which should be fostered by opportunities for stakeholders to come together to share information and ideas. The sentiments communicated by some of the participants in February 2013 highlight the importance of having a healthy and cohesive communication strategy based on mutual trust and respect. Breakdowns in trust will inevitably lead to conflict in situations when there are contrary personal values or vested interests. As pointed out in the section “Public Education and Awareness,” communication must be part of a unified, long-term outreach strategy and not a one-off transmission of facts, rules, or policies. If not, such information will inevitably be perceived as a “dictate” from above. Furthermore, there must be adequate opportunities for dialogue so that concerns can be voiced and acknowledged. 27 During four workshops conducted between March and April 2013, one of the authors focused specifically on the effectiveness of science cafés in the community of Sackville (Phillips, “Science Cafés”). Science cafés were used in Sackville to broach topics related to the local impacts of climate change and flood risk, while engaging community members in a dialogue with scientific and professional experts. These public fora resulted in a rich collection of original ideas about moving forward to address the vulnerability of Sackville in the face of climate change (Phillips, “Science Cafés”). 28 Key elements determining the success of the science café model include the level of accessibility of the presentation, which must be intelligible and relevant to laypersons, and the opportunity to engage directly with an expert, thereby taking learning outside formal institutions and into a more egalitarian setting. The collaborative and comfortable environment that science cafés create allows community members to feel at ease to ask questions and gauge public opinion of their hitherto private ideas, thus kick-starting the process of participatory decision-making. Research has shown that this interaction facilitates mutual learning and leads to the co-production of knowledge, which then emerges from both experts and community members interested in issues that impact the community (Hirakawa 218). 29 The participants in the February 2013 project listed a number of concerns pertaining to governance. Governments tend to be compartmentalized in the way they operate, which hinders efforts to communicate flood risk and offer coherent action plans. Without clear planning guidelines formulated at the provincial level, insufficient support is provided to communities attempting to develop their own adaptation strategies. Furthermore, communities may pursue adaptation policies at the local scale that diverge from best practices and hinder attempts to lower vulnerability at the provincial scale. The Community Planning Act does not require municipal plans to include policies on climate change adaptation or even enact procedures that will increase community sustainability. While municipalities are empowered to include such strategies as part of their municipal plans, this type of planning is not mandatory. As such, communities are permitted to ignore the issue entirely—and many in fact do. Alternatively, many municipalities will make only fleeting references to sustainability and adaptability, without outlining actionable, locally relevant strategies. Several participants in our region signalled that, although Sackville has been one of the earliest New Brunswick communities to adopt an integrated community sustainability plan, few of the measures recommended therein have been implemented and the committee tasked with the role of overseeing this issue rarely meets. 30 Other leadership issues include a tendency to think in the short term and to respond only to immediate political, social, and economic concerns. Our interviews with planners, municipal leaders, and residents revealed that a “development at any cost” philosophy is a prevalent force that drives development in New Brunswick, which results in primarily economically based and short-term land use decisions. Leadership was singled out by the November 2013 focus groups, as well as in one-on-one interviews, as an important component of successful community adaptation. The November participants indicated that political will, coupled with a sense of responsibility to champion the issue in the face of adversity, was a necessary co-requisite. This underscores the need for ongoing consultation between provincial, municipal, and rural planning professionals across the province. 31 Our consultations discovered strong agreement that a province-wide flood risk reduction strategy could set guidelines for all jurisdictions in the province. Beyond the immediate concern for flood risks, there is actually no planning policy at the provincial level, let alone one that designates sustainable development and climate change adaptation as priorities in the New Brunswick planning process. While the province has a longstanding Coastal Areas Protection Policy, our interviews with provincial planners determined that it has been largely ignored at the local level, where coastal development has continued to be authorized and sea level rise has not been a major factor in plan revisions and protected area zoning. It is clear that by ignoring the provisions permitting such municipal zoning bylaws in the Community Planning Act, the province is missing a leadership opportunity to establish a unified vision for planning in New Brunswick as well as to offer specific expectations for planning practices and regulations. 32 Our community consultations indicated that it was deemed appropriate for a provincial planning policy to outline standards for development in areas that are subject to flooding and likely to be impacted by rising sea levels. Moreover, a planning policy could outline clear expectations for sustainable development strategies in both urban and rural areas. If nothing else, a provincial planning policy is an ideal vehicle for the province to express its commitment to planning sustainably and, with climate change in mind, encourage and support the development of sustainable strategies at local levels. It should be acknowledged that the former government authored a 2014 consultation document designed to clarify the need for province-wide flood risk reduction (the aforementioned New Brunswick’s Flood Risk Reduction Strategy). However, a new government was elected in October 2014 and, to date, it has not moved forward on these issues. If the current government is unwilling to move forward, it will continue a pattern of delay that has been ongoing for over a decade. 33 Our consultations also determined that local governments often seem unaware of the legal toolkits at their disposal and are perceived as not fully tapping into local planning expertise. Zoning is perhaps the most effective tool for improving sustainability within a community. Many of the principles of coastal zone management, including the management of local land use with the aim of reducing community vulnerability to climate change, can be addressed by zoning bylaws. Many of the planners whom we interviewed are keen to implement such principles. There are a number of ways in which a zoning bylaw can be modified to better reflect the principles of sustainable community development and planning: for example, by increasing the prevalence of mixed use zones, by defining areas vulnerable to flooding as flood risk zones, and by reducing the prevalence of low density zones. 34 However, zoning bylaws in New Brunswick do not always reflect these principles and, consequently, this very effective tool for improving sustainability is often underutilized or unknown to municipal leaders. A municipal plan is an appropriate vehicle for a municipality to clearly state that minimizing and/or modifying development in flood-prone areas is a priority. Several planners who attended our sessions used Shediac’s Municipal Plan as a local example of municipal leadership. Several planners who attended our sessions considered Shediac’s plan to be a progressive example of how municipal leadership can address the need for climate change mitigation at the community level. The plan acknowledged coastal flooding as a significant threat and outlined ways in which zoning bylaws could be designed to require appropriate building regulations and define minimum shoreline setback distances for structures. In 2015, the various communities within the Tantramar region of New Brunswick, including Sackville and Port Elgin, will be undertaking five-year reviews of their municipal plans, which offers an ideal opportunity to them to demonstrate leadership in these critical areas. 35 In New Brunswick, communities face a number of challenges in adapting to climate change. While research has shown that the majority of people believe that climate change is a significant problem, far fewer consider themselves personally vulnerable. This speaks to the necessity of treating adaptation planning as a long-term dialogue among stakeholders, of sharing and receiving information about risk, and of developing a process for engaging the public in discussions surrounding mitigation strategies. It is the responsibility of elected provincial and municipal leaders, professional planners and advisory committees, researchers and educators, and New Brunswick citizens in general to create opportunities for education and learning within their communities. The tools discussed in this paper (in particular, science cafés and planning software such as the Community Adaptation Viewer) have proven to be successful in building consensus and advance adaptation planning. However, the Tantramar case study illustrates that the ultimate success of such initiatives will depend on the level of interest and commitment displayed by government officials and on their ability to engage the public in appropriate mitigation and adaptation planning and actions. Within the professional planning and climate change research communities, there has been active national discussion and education on planning for climate change. These professional bodies can certainly act as major participants in any coordinated educational model that the province might wish to develop, productively joining the leadership of elected officials and legislators across the province. Adger, W. Neil. “Vulnerability.” Global Environmental Change 16 (2006): 268–81. Print. Aggett, Graeme, and Chris McColl. “Evaluating Decision Support Systems for PPGIS Applications.” Cartography and Geographic Information Science 33 (2006): 77–92. Print. Appleton, Katy, and Andrew Lovett. “GIS-based Visualization of Development Proposals: Reactions from Planning and Related Professionals.” Computers, Environment and Urban Systems 29 (2005): 321–39. Print. Bagnoli, Franco, and Giovanna Pacini. “Sipping Science in a Café.” Procedia Computer Science 7 (2011): 194–6. Print. Bailey, Keiron, and Ted Grossardt. “Toward Structured Public Involvement: Justice, Geography and Collaborative Geospatial/Geovisual Decision Support Systems.” Annals of the American Association of Geographers 100 (2010): 57–86. Print. Barndt, Michael. “Public Participation GIS: Barriers to Implementation.” Cartography and Geographic Information Systems 25 (1998): 105–12. Print. Berry, Robert, and Gary Higgs. “Gauging Levels of Public Acceptance of Visualization Tools in Promoting Public Participation: A Case Study of Wind Farm Planning in South Wales, UK.” Journal of Environment Planning and Management 55 (2012): 229–51. Print. Cohen, Joel E., Christopher Small, Andrew Mellinger, John Gallup, Jeffrey Sachs, Peter M. Vitousek, and Harold A. Mooney. “Estimates of Coastal Populations.” Science 278 (1997): 1211–12. Print. Craig, William J., and Sarah A. Elwood. “How and Why Community Groups Use Maps and Geographic Information.” Cartography and Geographic Information Systems 25 (1998): 95–104. Print. Cumberland, Sarah. “Life-saving Learning Around the Drinking Pot.” Bulletin of the World Health Organization 88 (2010): 721–2. Print. “What Sandy Did Next.” The Economist, 10 November 2012. Web. 25 February 2015. <http://www.economist.com/news/united-states/21566001-thousands-still-suffer-effects-superstorm-and-another-storm-arrived>. Government of New Brunswick. A Coastal Areas Protection Policy for New Brunswick. Fredericton: Government of New Brunswick, 2005. Print. ---. New Brunswick Climate Change Action Plan: 2014–2020. Fredericton: Government of New Brunswick, 2014. Print. ---. New Brunswick’s Flood Risk Reduction Strategy. Fredericton: Government of New Brunswick, 2014. Print. Hirakawa, Hiroshi. “Science and Technology Communication.” Sustainability Science: A Multidisciplinary Approach. Ed. Hiroshi Komiyama, Kazuhiko Takeuchi, Hideoki Shiroyama, and Takashi Mino. Tokyo: United Nations UP, 2011. 204–19. Print. Intergovernmental Panel on Climate Change (IPCC). Climate Change 2007: Synthesis Report. Fourth Assessment Report of the Intergovernmental Panel on Climate Change. Geneva: IPCC, 2007. Print. Jude, Simon. “Investigating the Potential Role of Visualization Techniques in Participatory Coastal Management.” Coastal Management 36 (2008): 331–49. Print. Lieske, David J. “Towards a Framework for Designing Spatial and Non-Spatial Visualizations for Communicating Climate Change Risks.” Geomatica 66 (2012): 255–65. Print. ---. “Coping with Climate Change: The Role of Spatial Decision Support Tools in Facilitating Community Adaptation.” Environmental Modelling & Software 68 (2015): 98–109. Print. ---, Tracey Wade, and Lori A. Roness. “Climate Change Awareness and Strategies for Communicating the Risk of Coastal Flooding: A Canadian Maritime Case Example.” Estuarine, Coastal and Shelf Science 140 (2014): 83–94. Print. Lockett, Jerry. The Discovery of Weather: Stephen Saxby, the Tumultuous Birth of Weather Forecasting, and Saxby’s Gale of 1869. Halifax: Formac Publishing Company, 2012. Print. Phillips, Emily. “Navigating Sustainability in the Wake of Climate Change: The Transition of Knowledge to Action in Sackville, New Brunswick.” MA thesis, Mount Allison University, Sackville, New Brunswick, Canada, 2014. Print. ---. “Science Cafés as a Sustainability Science Method for Co-producing Knowledge about Climate Change Impacts: A Case Study of Sackville, New Brunswick.” In preparation. Sieber, Renee. “Public Participation Geographic Information Systems: A Literature Review and Framework.” Annals of the American Association of Geographers 96 (2006): 491–507. Print. Turner B.L. II, Roger E. Kasperson, Pamela A. Matson, James L. McCarthy, Robert W. Corell, Lindsey Christensen, Noelle Eckley, Jeanne X. Kasperson, Amy Luers, Marybeth L. Martello, Colin Polsky, Alexander Pulsipher, and Andrew Schiller. “A Framework for Vulnerability Analysis in Sustainability Science.” Proceedings of the National Academy of Science 100 (2003): 8074–9. Print. Vasseur, Liette, and Norm Catto. “Atlantic Canada.” Adaptation: Canada in a Changing Climate 2007. Ed. Donald S. Lemmen, Fiona J. Warren, Jacinthe Lacroix, and Elizabeth Bush. Ottawa: Government of Canada, 2008. 119–70. Print. Weaver, Andrew. Keeping Our Cool: Canada in a Warming World. Toronto: Penguin Canada, 2008. Print. Wilby, Robert L., and Rod Keenan. “Adapting to Flood Risk Under Climate Change.” Progress in Physical Geography 36 (2012): 348–78. Print. Wilson, Jeff, Ryan Trenholm, James Bornemann, and David Lieske. 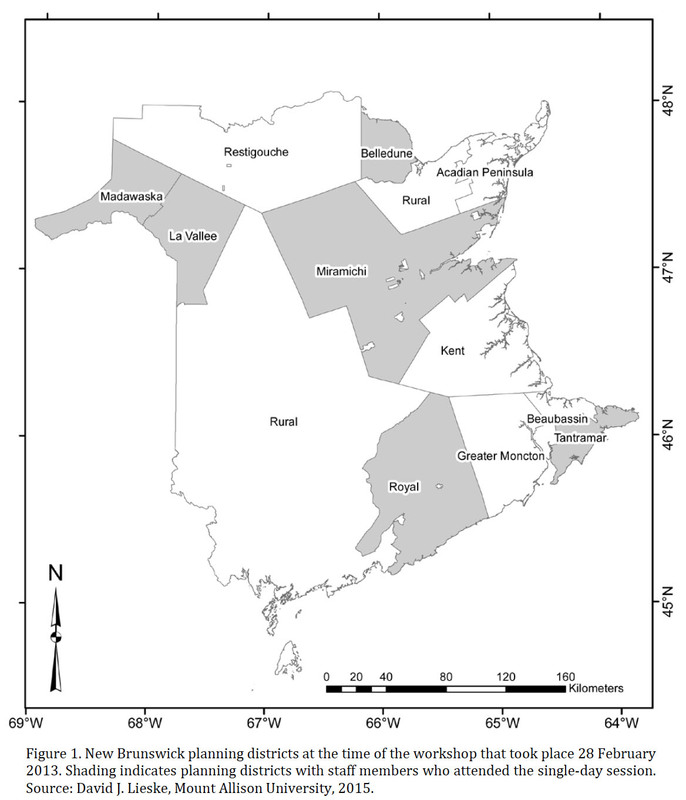 Forecasting Economic Damages from Storm Surge Flooding: A Case Study in the Tantramar Region of New Brunswick. 2012. Web. 10 July 2014. <http://atlanticadaptation.ca/sites/discoveryspace.upei.ca.acasa/files/Tantramar-ForecastingEconomicDamages-MtA-2012.pdf>. Do you see the major barriers to improving sustainability/adaptability in New Brunswick as coming from legislation? Or are they coming from elsewhere (e.g., views of council members, economic expansion mentality, lack of education, lack of commitment)? Which kinds of modifications would eliminate or reduce the impact of these barriers? Can you think of any specific instances where you were able to implement more sustainable practices or a climate change adaptation strategy in your region’s planning process? Where did the authority to do this come from? Which tools in the CPA have you used to implement increase sustainability/adaptability in your community/district? Which kinds of tools are missing? How is the planning process a tool for addressing each of the above? Which unique features of your district or region make it so that particular areas of sustainable development require more focus than others? Coastal adaptation? Urban adaptation? Conservation/biodiversity protection? In the case of an area with coastal or river area susceptible to climate change flooding: Do you have any flood area policy? Has there been serious discussion of taking steps to adapt to rising sea levels? How has planning in your district introduced strategies for climate change adaptation? What would facilitate future introduction of more widespread strategies? Do you draw inspiration from approaches adopted by other jurisdictions in planning for sustainability or implementing climate change adaptation strategies? Any specific examples? Does the existence of a municipal green plan translate into increased sustainability or adaptability? Can you think of any specific instances where you were able to implement more sustainable practices or a climate change adaptation strategy in your region’s planning process? From where did the authority to do this come? Which tools in the CPA have you used to implement or to increase sustainability/adaptability in your community/district? Which kinds of tools are missing? Which unique features of your district/region make it so that particular areas of sustainable development require more focus than others? Coastal adaptation? Urban adaptation? Conservation/biodiversity protection? Does the existence of a municipal green plan translate into increased sustainability/adaptability? Can you give us an overview of your study and what it seeks to achieve? In what stage of your research are you currently? What will its outcome be? What kinds of changes do you envision resulting from your research? Have you had any success in implementing change as a result of your RAC project? What do you understand to be the implications of your study? How, in an ideal world, would one go about realizing those changes? How attentive or interested have local planners been in your research project? Have they communicated with you or shown interest in your research? 1 The Atlantic Regional Adaptation Collaborative (http://atlanticadaptation.ca) was a program sponsored by National Resources Canada (NRCan) and the provincial governments of New Brunswick, Nova Scotia, Prince Edward Island, and Newfoundland and Labrador to support climate change adaptation research and activities. While some activities are ongoing, the bulk of the work was conducted from 2009 to 2012. 2 The RCE-Tantramar (http://rcetantramar.org) is one of six Canadian Regional Centres of Excellence on Education (RCE) for Sustainable Development, originating from a 2002 meeting of the United Nations General Assembly. The central goal of the RCE-Tantramar is to support sustainability initiatives through education, with a focus on seven priority areas: energy, water, food, bio-regional planning, coast and infrastructure strategy, social support, and regional transportation. 3 EOS Eco-energy (http://eosecoenergy.com/en/) is a not-for-profit, environmental, non-governmental agency situated in the Town of Sackville, New Brunswick. Primarily focused on energy conservation and promotion of renewable energy technologies, EOS Eco-energy is also actively involved in sustainable community planning within the Tantramar region. 4 The Argosy (http://argosy.ca) is the weekly Mount Allison University student newspaper. 5 The Tantramar Community Adaptation Viewer (TCAV) is a web-based GIS tool for visualizing and analyzing community vulnerability to risks related to climate change, such as flooding (http://arcgis.mta.ca/toolkit). The software was developed by the Geospatial Modelling Lab (GML) of Mount Allison University and is freely available.